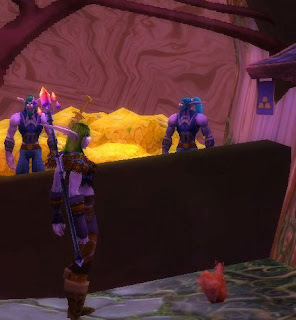 I was just going to the Bough of Eternals bank in Darnassus to deposit some of my new and more valuable archaelogical finds, when I saw something rather unusual. There was this adorable squirrel trying in vain to get the attention of one of the bankers. He was chattering and scampering from foot to foot, trying to leap high enough to attract attention. Now I have no idea what the fellow wanted, or how he expected to communicate with said banker, but I flagged the banker down nonetheless and went about my business. I suppose it's entirely possible that he had left his cache of nuts at the bank, after all it is in a tree. Or maybe he had come for help, having been polymorphed into a squirrel by a mad magician. I may never know, as I couldn't bear to stick around, for I was struggling to control a fit of laughter. I quickly shapeshifted into my storm crow form and flew away, cackling to my hearts content.